Is Remote Work a Fit for Your Company? Network Depot, as a leading provider of IT support in the DC metro area, continually advises its clients on IT trends that will improve their operations. 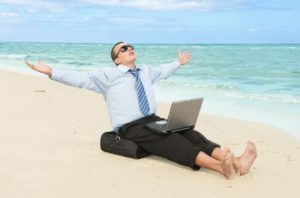 For example, as technology advances, the advantages of offering remote work opportunities for employees is something that every company should consider. Many employees feel positive about having flexible remote work options. The work-life balance question is usually the most important issue found in employee surveys. Employees will feel more engaged and empowered when they have the option of avoiding a commute or being able to work their schedule according to their unique needs. When employees’ morale is high, their productivity generally increases, which is a win-win situation for employees and employers. With the remote work option, your company’s operations won’t be affected as much by inclement weather. In addition, employees who feel under the weather will be more willing to spend some time on work while recuperating at home and won’t affect your other employees. Having the remote work option, means your company will have access to the best talent worldwide. Having remote workers, some using their own equipment (See BYOD blog for more information), can reduce the amount of money spent on physical infrastructure and IT costs. Even with the most advanced technology, there is nothing that can replace the level of interaction of people working face-to-face. Some employees, usually extroverts, thrive on personal contact, and will feel isolated and withdrawn if forced to work from home. Also, there are some industries where personal interaction is a crucial factor, where remote work should be limited if offered at all. In order for an employee to work from home effectively, they must be able to avoid distractions that happen at home and not succumb to any temptations to avoid working without direct supervision. It is important for the company to develop methods to monitor the level and quality of the output of employees to ensure that remote working is adding value. For some businesses and some positions, it is difficult to effectively monitor employee productivity. In these situations, the decision to offer the remote work option can best be determined by an employee’s proven work record and your trust in their abilities and character. Each company should develop comprehensive guidelines about what is expected from each employee working remotely. Expected performance levels should rise when you implement this option. Your company should train workers on how to use their work telephone as if working from the office and how to safely access all information normally stored on their workstations or shared drives. Special attention should be given to securing company data on all devices. Please click on the link below to read about the trend toward Bring Your Own Device (BYOD). Is BYOD Right for Your Company? If your company decides to use the remote work option, you should make sure that employees have access to the latest equipment with the highest level of internet connectivity as well as chat applications such as Skype and collaboration tools such as Google Apps. Also, make sure your employees have easy access to applications and files through Remote Desktop, VPN, or cloud options. In this ideal scenario, employee morale will improve even more and they will be at their peak level of productivity. It is advisable to have a test or pilot stage for all employees who would like to experiment with the remote work option. During this period, both the employee and employer can evaluate if this option is suitable. It is important that remote workers still feel like they are part of a team at your company, whether they are on location or not. Your company should provide many opportunities for them to interact and work with their colleagues using different collaborative and social media technology. For example, your company should make sure there is a weekly video conference call, at a minimum, for all employees in their respective departments. The hybrid option works well in many IT situations and might be the best solution for your company regarding remote work options. Every employee is different, thus, your company should offer flexible options. For example, some workers want or need to be in the office, so it would be counterproductive to force them to work from home. Others may work best when working certain times from home and certain times in the office. Therefore, your company might want to allow some workers to telecommute every day, some a few days or less, and some not at all. Testing worker productivity before committing to a remote work method is also highly recommended no matter which option your company chooses. Each company is different, so there is no one size fits all solution when it comes to offering remote work options. Network Depot is ready to advise your company on the best solution and will implement new remote work options to make your company operate more effectively and efficiently. For assistance with remote work options and any other IT-related requirements, please contact us here at Network Depot.